So, you’re thinking about sealcoating your asphalt driveway? I could start by recommending you have the work done by a trusted contractor but that’s not why you came here. You want the inside scoop on how to do it yourself. An asphalt driveway is an investment that is well worth protecting. Proper maintenance can triple the life of a driveway, saving you thousands of dollars while giving your property curb appeal at the same time. Start by looking for trouble spots such as pot holes, crumbling areas, cracks or fluid stains. Thoroughly clean any fluid stain with a degreaser or perhaps Dawn and scrub with a stiff bristle brush. If you’re not confident that the stains have been completely removed apply a primer that can be found at the hardware store with the other driveway repair materials. If your driveway’s cracks have widened into potholes, you need to repair those areas. Blacktop patch, also called cold patch should be used to repair potholes, deep depressions, and crumbled areas. Blacktop patch is essentially ready-to-use asphalt that comes in a bag. Brush or vacuum the area clean, making sure to remove any pieces of loose asphalt. Cut open the bag and use a shovel to spread blacktop patch about 2 inches deep across the hole. Compact the area with a hand tamper, or a spare length of a 2 x 4. Add more blacktop patch, if necessary, and compact the area again. Repeat this process until the hole is slightly overfilled. Then drive your car back and forth over the patch until it’s flush with the driveway. If the patch sinks below the surrounding surface, add more blacktop patch and repeat. Allow at least 24 hours for the blacktop patch to cure before applying the sealer. Fill in cracks. There are a lot of different products for crack filling. Some products are designed for filling smaller cracks such as caulking gun products and squeeze bottle material and others such as trowel grade crack fillers are better for larger cracks. 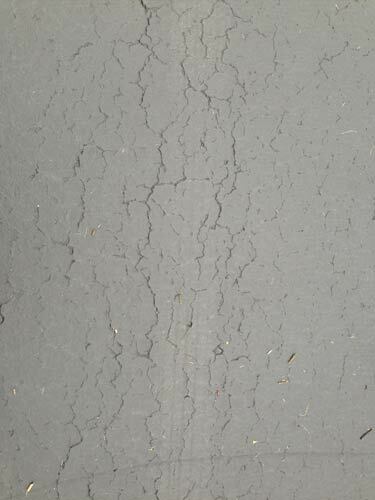 Some larger cracks may require foam backer rod to give the crack filler something to bond to. Crack filling is labor intensive and time consuming but it’s very important to keep water from penetrating to the base of the driveway. Before you add crack filler make sure the cracks are clean and dry. Use a screwdriver to scrape out dirt and vegetation and a blower or wet/dry vacuum to remove any debris from the crack. Fill the crack so that it is level to the surface. You may need to make a second pass to bring the crack filler as close to surface level as possible. Make sure to allow the crack sealant to thoroughly cure before you begin the sealcoating process. After you have completed these tasks it is time to clean and prep the driveway. Start by trimming the grass back from the edges taking care not to make a trench for water to run down and possibly under the driveway. It is important to properly seal the edges because structurally, this is the weakest point. Use a push broom or blower to remove any loose debris. Using a water hose or a pressure washer (taking great care not to damage the asphalt) can also be helpful. A clean driveway will promote proper adhesion of the sealer. Thoroughly mix the sealer using a paddle attachment on a drill. Turning the pails upside down overnight will help with the mixing process. Make sure to have all the material thoroughly mixed before you begin. If you stop and allow the sealer to dry before starting again there will be a noticeable difference in color and perhaps texture in those areas. Check the forecast. Depending on the product you will need anywhere from several hours to several days of drying time. Most driveway sealer manufacturers recommend that temperatures be at least 50 degrees and rising and not falling below 50 degrees at night. Again, depending on the product you will need anywhere from several hours to several days of dry sunny weather for the product to properly cure. For the most part there are two types of asphalt sealers used here in the Midwest; refined purified coal tar sealers (a byproduct of coal to coke conversion process) and asphalt emulsions (a byproduct of the petroleum industry). The ecological effects of refined coal tar is a topic of great debate in the industry. For more information visit: thetruthaboutcoaltar.com. The difference in durability is that refined coal tar products will protect against gasoline and oil spills and asphalt emulsion products will not. Refined coal tar products will also last longer. Refined coal tar is typically used by professional contractors and usually not available in home improvement stores. Expect to pay anywhere from $15 to $20 for a 5 gallon pail of a decent asphalt emulsion sealer that will cover 300 – 400 square feet, depending on the condition of the driveway. Different products call for specific application instructions. For most products a squeegee/brush can be used to apply the product. A typical homeowner grade applicator sold in your local hardware or home improvement center will cost about $20. Again, it’s important to follow the manufacturer’s recommendations but for the typical driveway sealer, here’s how it’s applied. Starting at the top of the driveway pour a liberal amount of sealer out and coat 3’- 4’ down the edges. Then, using the brush side of the applicator work the sealer into any porous areas. Now, using the squeegee side go from edge to edge spreading the sealer thin but covering all areas. Take caution not to leave any excess material in low areas. Try to keep your squeegee marks as even as possible while repeating this method to work down the driveway. Wait 6 – 12 hours before applying a second coat if necessary. Two thin coats are better than a single thicker coat. Once you’re done place an empty bucket at each side of the driveway and run a piece of flagging tape across to keep unwanted traffic off. Allow 48 hours before driving on it. The biggest mistake homeowners make is over-sealing. Allow the sealer to wear off to the point where a small amount of the aggregate is bare. I would suggest two coats the first time the driveway is sealed and then a single coat every two to four years. Most people will find that by the time they add up the cost of the material, the applicator, the ruined clothing, their time and compare it to the cost of having a reputable contractor do the work the difference in cost usually doesn’t justify the effort. Many times it is less expensive to have a professional do the work. Asphalt maintenance companies buy several thousand gallons at a time of sealer for a fraction of what the homeowner pays. A trusted contractor will provide a superior product to the ones found in home improvement centers, have commercial grade application tools to provide a faster, more even finish and be more skilled at keeping the sealer off the surrounding structures. If you do decide to hire a contractor, do your homework first. We’ll cover that topic on another day.